Seeing that the last review was written in 2012, I thought I'd provide some info that might be useful to those considering buying one of these popular old CD players. This is not a review about sound quality, because it is unarguable that this is a decent player. I'm posting this as a warning about failed components. You're most likely going to invest some money and time in repairs and upgrades, so don't spend a lot of money for one, even if it looks mint and comes with the original box. To cut to the chase, I just purchased a non-working 640C. The tray was sticking and although the CD would spin, the laser would not focus and did not read the disc. As expected, cleaning and a new belt solved the transport problem. The laser at least tried to focus after the lens was cleaned but it still would not read any CD's. Upon closer inspection I discovered that a half-dozen electrolytic capacitors had failed. Two on the servo board and four on the DAC board were showing obvious signs of leakage. Obviously voltage regulation on the servo board is so out of spec that the laser pickup cannot operate properly. Once these caps are replaced I'll post an update on the success or failure of the operation. While all this is not unexpected of old capacitors, of all the stereo equipment I've owned and worked on over the years this is the worst case of catastrophic capacitor failure I've seen for a piece of electronics gear that is less than 15 years old. Though designed in the UK, these players were built in China and are well known to have had suffered from quality-control issues. The capacitors in particular are very low quality, more like you'd expect to see used on much lower end equipment. So, if you purchase one of these CD players, working or not, plan on replacing the electrolytic capacitors. If I counted correctly, there are 22 on the servo board and 13 on the DAC board. The good news is that the boards are very easy to remove and work on, but the bad news is that if you aren't an electronics DIY'er you'll probably spend about $300 to have it done for you (mostly labor cost). By the way, the Version 2 seems to have been first released in 2001, with the Version 1 being earlier, although there appears to have been some overlap sales-wise. The main difference being that the V2 has two Wolfson WM8740 DAC chips running on separate channels, while the V1 has a single chip running both channels. All reviews suggest that the V2 is the one to own unless you're going to modify the player with a tube output stage as I am doing, in which case the V1 or the 540C are a bit simpler to modify. I'll try to post an update when all the work is finished. Sounds ok in stock form.I opened mine up and was shocked at the site of cheap deplorable Chinese capacitors Cambridge loaded on the main,dac,and servo board.Well,I replaced over 90% of the capacitors with much better quality brands.The player now sounds like it should in my opinion Bass is much tighter and smoother.Treble is cleaner and emits more micro detail from recordings.It's really worth the effort to do this with this model cd player due to the dual Wolfson dacs.It has so much more potential now.I'm happy with it and not to mention I increased it's lifespan as well with all the low esr higher ripple caps installed as the circuits are more stable and simply sounds leaps and bounds better. I was very pleased with the sound - very detailed and clean, with no harshness or otherwise grating high ends, and would give this model the highest rating for value and be 110% satisfied if not for the pesky detail of "product reliability." I would expect the unit to have a lifespan of more than 4 years; instead it simply stopped playing mid-disc (disc appears to be playing fine, but no audio output). Moreover, it has had intermittent problems earlier: about 2 years ago, the pause button would cause the display to read "CLOSE" and the unit would not accept any further controls until the disc was ejected. This lasted about a year before working correctly again. During the past several months, play would do the same thing roughly half the times the play button was pressed. This is the second Cambridge Audio component that I was initially very pleased to own, but failed within a few years (the first being an integrated amp). I would not buy any other components from CA until they can get their act together and start manufacturing reliable components again. I got the Cambridge Audio 640 v2 range (Amplifier, CD player, DAB radio) together with the Bowers & Wilkins 684 speakers, cables, delivery, and Danish taxes (*sigh*) for almost 15000 DKK (ca. 2000 eur, 3000 usd). It was the best system for that money that I could find, after having visited quite a few stores here in Copenhagen with CDs I know well (containing mostly classical music), and having spent quite a bit of time listening, also with friends. I did find better systems, but the cheapest of those was 6000 DKK (800 eur, 1200 usd) more expensive, which exceeded my budget. What I can say is that I am exceedingly happy with this system. I've had no problems whatsoever, and with the music I tend to play on it, and in my room, the system simply sounds superb! At the same time, I feel that there are such large differences between systems, and in particular, that there are such dependencies on the music one tends to listen to, that anyone who considers buying a system should forget all they've read, and go out and listen to many types of systems themselves, figure out what they get for what price, and figure out what kind of price and performance make sense for *them*. However, that said, I have been a bit disappointed not with the sound, but the usability of the products. With 3 boxes (Amp, CD player, DAB radio), I got 3 remote controls, where I would have preferred one. For the CD player, seeking (continuous forward or backward), isn't nearly as nice to use as on the el-cheapo Sony I bought over 10 years ago. The blue power leds are switched on both on standby and when they're actually switched on (different intensities, though, but couldn't they be SWITCHED OFF when I put the system on standby?). And then there are completely useless features such as *dimming* the lights from the remote control. Please take a few lessons from Apple regarding simplicity, and easy of use, would you? But concerning the sound, I am totally totally totally satisfied. As I said, I selected this system on sound, and *cough* price. When it comes to that, it's as simple as that: I got the very best system I could find for a price I could live with. And my music collection lives like it has never lived before. I love this system. Hi, I just bought Cambridge Audio 840A & Cambridge Audio 840C from this store : http://stores.ebay.com.au/Perfect-Sound-Audio a few weeks ago, this shop offer good price with good product & service. I am very satisfied with the product performance, it’s value for money and high quality of product. It's highly recommended product. Solid build quality of unit and remote; expansive soundstage; very good detail and nice vocal rendition. Bass quite tight and restrained in comparison to my bass-heavy DVD player. Hit and miss reliability or quality control; a unit that simply wont recognise discs should not end up in a store. Note: Bought new June 2008, but drop-down menu only goes to 2006. Having played CD's with my DVD player for some time, I took the plunge with a dedicated CD player. 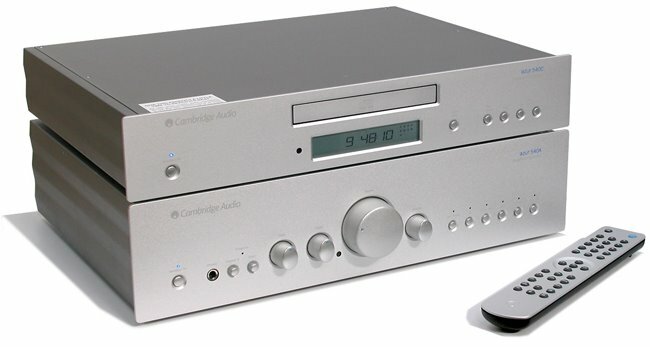 I nearly bought a Marantz CD6002, but when comparing in store I opted for the Cambridge; it had more bass punch and cleaner vocals than the Marantz, although the Marantz did sound good. I was initially very disappointed; upon getting it home, it refused to read any discs at all and it had to go back. The second unit worked without a hitch, and I have to say it sounds superb out of the box (I'm comparing it to my DVD player though). I look forward to it opening up a bit more with time, as I'm assured it will. The biggest leap was in stereo separation which seems to push the soundstage beyond the outer edges of the speakers; it's even better though headphones! Detail is also fantastic, although I noticed this shows recording flaws with a few poorer CD's, which generally stay hidden with cheaper players. 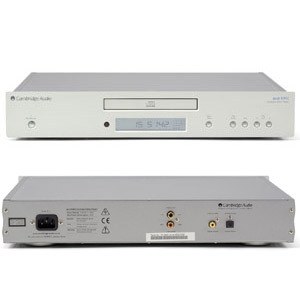 I have to wonder why Cambridge called this the "Version 2" of the 640, as it could almost be regarded as a different model with twin DAC's, new power supply etc. Price, reliability, overall smooth sound regardless of source musical stylings. What to expect? A very solid CDP I have been spinning for over a year @ 20+ hours per week. Overall a damn fine unit with few faults. I run a very pedestrian setup - Cambridge 640C V.2, Denon PMA-200 IVR, and a pair of Paradigm Studio 100 v4. Mogami cable throughout., 10Ga to speakers. Fairly big room with 10' ceilings. I listen to all sorts of music, and the Cambridge 640C v2 is a fine player that sounds good and is reliable. Even sound across the board. Natural Tone, Great remote control, Midrange. The Azur 640C V.2 is a pretty good player for the price. Build quality (at least from feel and weight) is good. The player's remote is great for the price and operationally the player is good. The sound is laid back but with fair rhythmic integrity. It has a really nice tone and will play any genre of music well. The midrange is its best talent. I found its focus was lacking, the bass power and control isn't great, the treble isn't detailed enough for me and can be splashy and soft at times. Dynamic resolve isn't as good as the magazines reviews suggest. The soundstage isn't very wide at all. However, how much can you expect for a budget player. I think in the right system with an owner who appreciates its laid back sound I think it will be a good player. Unfortunately, I found it boring and ended up having a system playing background music and not holding my interest in music that normally really connects with me. I need to preface this review by saying I have the 640C v.2. It is the second generation of the product described in the previous reviews. Secondly the dropscreen prompting a model year did not give 2007 as an option. So I indicated 2006 which is incorrect. Getting down to the nuts and bolts this is a great CD player. After a burn-in of about 150 hours it produces a very smooth and laid back sound. It does not suffer from being overly bright. It will not create the magic of making bad CDs sound good however. Good CDs will sound better than ever which is a satisfactory goal. So far I would say the classical music in my collection has shown the most improvement in presentation. Crummy low budget jazz stuff still suffers. Popular music like Lyle Lovett sounds surprisingly good.